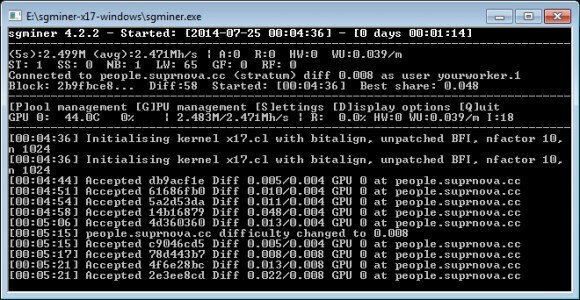 If you are looking for a GPU miner for Nvidia video cards supporting the new X17 algorithm, then you don’t need to look for it anymore as djm34 just added X17 support to his fork of ccMiner (source). We have compiled a windows binary of the new release (using CUDA 5.5) and on a GeForce GTX 750 Ti video card we are getting a hashrate of about 1700 KHS and about 3200 KHS on GTX 780 Ti. 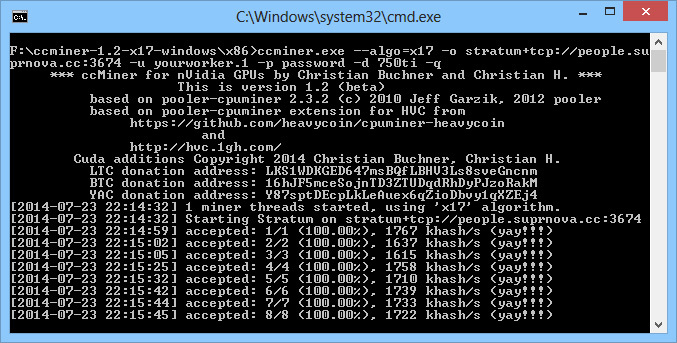 Have in mind that this ccMiner fork does support other algorithms as well, including whirlpool that was just recently added. There are still not much crypto currencies using the X17 algorithm as it is really new, but you can already try mining People’s Coin (PPL) for example.